Are you leading a data migration? If you are, or have previously, you’ll know how difficult they can be to deliver on time and on budget. 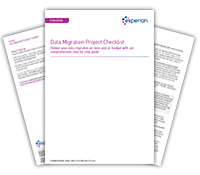 Safeguard your efforts by reading this free Data Migration Project Checklist from data migration expert, Dylan Jones. This 7 phase checklist will help data migration project leaders by arming them with an extensive checklist that can be used to validate their own approach from before they get started to auditing the data post-migration. Also included is information about Experian Pandora software and its role in making data migrations easier, faster and more economical.